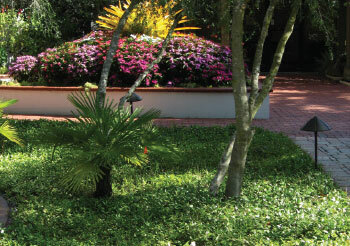 Groundcovers, a Florida-friendly turfgrass alternative, add color and texture to your landscape in areas where turf won’t grow or you don’t want it to grow. In time, groundcovers require fewer inputs than turfgrass such as fertilizer, pesticides, water, and overall maintenance. There are several Florida-friendly turfgrasses. As with all plant additions and before making the purchase, consider your site conditions: sun, shade, soil pH and type, wet, dry, mature size, and deed restrictions. A few that do well in north, central, and south Florida are Perennial Peanut, Bronze Beauty Jasmine, and St. Bernard’s Lily. Perennial Peanut, Arachis glabrata, has a slow- to medium-growth rate and can reach a height of ½–1 foot and a spread of 1–8 feet. How fast it spreads and its height depends on the cultivar. It prefers slightly acidic to slightly alkaline soil pH, 6.0–7.2, and sandy soil. Soil moisture should be well drained. Perennial Peanut has high drought and salt tolerance and thrives in full sun. Perennial peanut has a lovely rounded leaf, dies back above ground in the winter, but the rhizomes remain alive underground. The plants return in the spring and produce yellow/orange flowers from summer through fall. This plant withstands foot traffic, needs no nitrogen fertilizer, and may spread aggressively. It can be damaged by frost in north and central Florida. Lynn Barber, Agent, University of Florida/IFAS Extension, Hillsborough County, is responsible for educating residents on the nine principles of the Florida Friendly LandscapingTM program. These principles include right plant right place, water efficiently, fertilize appropriately, mulch, attract wildlife, manage yard pests responsibly, recycle, reduce stormwater runoff, and protect the waterfront. Barber is past president of the Florida Association of Natural Resource Extension Professionals and has received numerous awards for programming, publications, and television and radio segments. As a Master Gardener, she has given back thousands of hours in environmental horticulture education to the community. Bronze Beauty Jasmine, Trachelospermum jasminoides ‘Bronze Beauty’, is a fast growing groundcover that can reach a height of 1–3 feet and spread of approximately 1–15 feet plus. 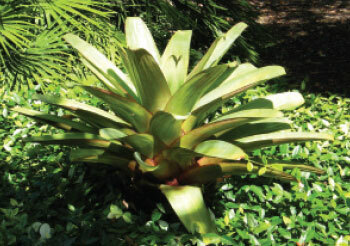 It thrives in full sun and does well in partial shade. This plant prefers well-drained to medium well-drained soil moisture and tolerates any soil pH from 4.5–8.0. Any soil texture works, from clay loam to sandy loam, from sandy to sandy clay. 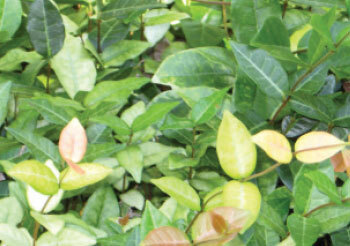 Bronze Beauty Jasmine has medium drought tolerance. This groundcover produces small, white flowers and is a beauty because of the three foliage colors: dark green, light green, and a reddish-bronze. Both Perennial Peanut and Bronze Beauty Jasmine will fully cover an area within two to three years depending on the spacing. Both groundcovers, spaced 24 inches on center, which means from the center of one to the center of the next plant, would require 100 plants to cover 400 square feet. Placed 36 inches on center, 100 plants would cover 900 square feet. The difference is the amount of money you want to spend on the plants, how many holes you want to dig, the amount of mulch you want to purchase/spread, and how soon you want the area to be fully covered. Mulch is important because it retains moisture in the soil so you can water less once the plants are established. It also suppresses weeds and adds nutrients to the soil when it decomposes. St. Bernard’s Lily, Anthericum liliago, is a fast growing plant that can reach a height of 1–1½ feet and spread of ½–1 foot. It is fast growing, prefers slightly acidic to slightly alkaline soil pH, 6.0–7.2. Any soil texture works, from clay loam to sandy loam, from sandy to sandy clay. Well-drained soil moisture is needed. It has medium drought tolerance, thrives in full sun, and does well in partial shade. St. Bernard’s Lily produces white flowers year-round. As always, follow the landscape or architectural control procedures in your deed restrictions before making changes. For more information about the nine principles of the Florida-Friendly LandscapingTM Program or for assistance with gardening-related questions, contact your local county UF/IFAS Extension and/or visit the University of Florida websites: http://solutionsforyourlife.com and http://edis.ifas.ufl.edu.